Grand Boulevard Park is a nice open space for families to enjoy the outdoors. 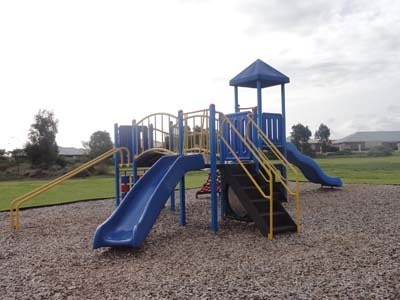 Playgrounds entertain the children, while parents and older family members can find other ways to entertain themselves. There are two main parts to the Grand Boulevard playground. The playground itself features two slides, a bridge, climbing frames, as well as a naughts and crosses game and plenty of places to play. It is compact, but its shape has the ability to evoke the imagination, to picture a castle, or a boat for example, in its place. 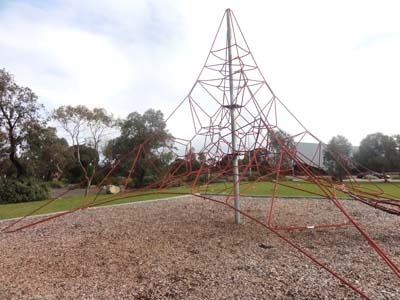 There is also a large spider-web like climbing frame. This is quite tall and can entertain both younger and older children. Younger children will enjoy climbing, while older children will enjoy the challenge of reaching the top. There is plenty of open space at the park. This is perfect for playing ball games or playing with frisbees or kites. The grass also offers a great spot to set up a picnic, and the surroundings are desirable, feeling more like a garden than a reserve. Other facilities such as seats, undercover areas and tables make this a good place to meet up with family and friends. It would be a good place to hold a small outdoor gathering, but some extra seats may need to be supplied. The park and playground are on the same block as the Quarry Skate Park. This features a large concrete skate park as well as some bike jumps. There is no skating or riding in the park, and these areas are separated from the park. This means you can enjoy the park without worrying of intrusion from the skate park, but the skate park offers another activity for children. For other spaces like this in the area, visit the Onkaparinga City Council's list of parks and reserves.